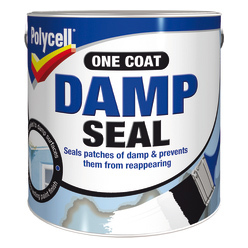 Polycell Damp Seal Paint has been specially formulated to seal patches of penetrating damp on interior walls and ceilings in just one coat, preventing them from showing through and spoiling decorations. Prevents damp from showing through and spoiling decoration. Seals patches of penetrating damp on interior walls and ceilings in just one coat. Also available as an aerosol. Cover furniture and carpets, always keep windows and doors fully open during application and drying. Thoroughly clean and repair the surface. Stir the product well, do not thin. Apply generously by brush to damp but not saturated surfaces, working well over the affected area and a wide surrounding area. 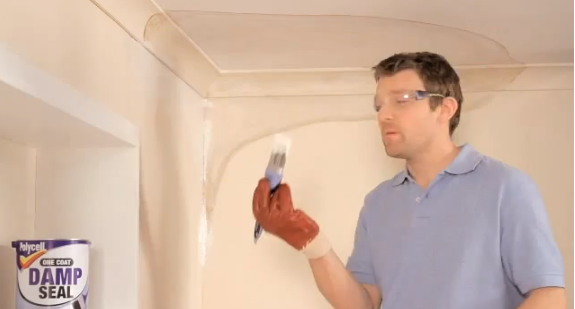 Allow to dry overnight before painting or wallpapering. Remove as much product from brushes before cleaning, using Polycell Brush Cleaner.